Designed as a first-choice vocal microphone, the AT5040 features an extremely smooth top end with controlled sibilance. Large-diaphragm characteristics and fast transient response also make it ideal for recording acoustic instruments such as piano, guitar, strings and saxophone. 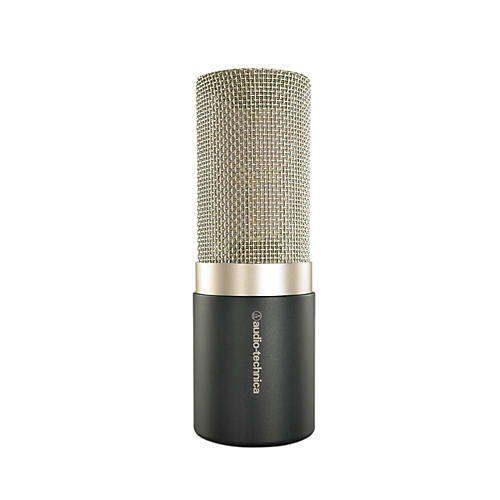 A new series from Audio-Technica, one of the leaders in microphone technology, it offers several innovative design aspects that promise to land it among the pantheon of truly great studio vocal microphones. The debut of AT's flagship 50 Series, the AT5040 represents a milestone in condenser design, offering remarkably musical high-fidelity performance, with profound realism and depth, presence and purity of sound. The first of the design criteria for the AT5040 was purity of sound. To achieve this, Audio-Technica engineers developed a four-part rectangular element, the pinnacle of AT's recent breakthroughs in sound-capture technology. Four exquisitely matched ultra-thin diaphragms function together (with outputs proprietarily summed) as Audio-Technica's largest-ever element, providing combined surface area twice that of a standard one-inch circular diaphragm. By using four diaphragms in a single capsule, the AT5040 delivers the benefits of an exceptionally large diaphragm, along with an extremely low noise floor, without increased weight, decreased transient response or other drawbacks that typically restrict diaphragm size. Another key AT5040 design feature is advanced internal shock mounting that effectively decouples the capsule from the microphone body. For additional isolation, each AT5040 is also provided with Audio-Technica's innovative new AT8480 shock mount. Every AT5040 is hand assembled and individually inspected for 100% quality control. Each microphone is enclosed in an elegant housing of aluminum and brass with high-quality gray finish for durability and low reflectivity. Discrete components have been selected for optimized capsule performance; in fact, every aspect of the microphone has been carefully considered to minimize any effects on the audio signal. This new 50 Series cardioid condenser is pure innovation, not emulation.